If you're considering starting up your own recycling operation, you should know that the business opportunities available are as wide-ranging and varied as the tons of stuff that we dispose of every day. Here's an overview to get you started thinking about the recycling business. 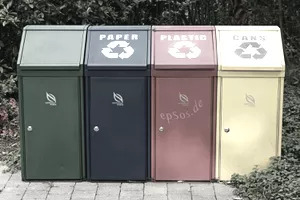 The links go to sample business plans for these types of recycling businesses. They're not just how-to examples for writers of business plans. Some contain a wealth of detailed information about the businesses. Medical waste refers to disposables generated at healthcare facilities such as clinics, hospitals, blood banks, dental practices, physician offices, veterinary hospitals, as well as laboratories and medical research facilities. According to the Medical Waste Tracking Act of 1988, "Medical Waste is defined as any solid waste that is generated in the diagnosis, treatment, or immunization of human beings or animals, in research pertaining thereto, or in the production or testing of biologicals." Some of the most common waste materials include discarded surgical instruments, discarded surgical gloves, culture dishes and other glassware, blood-soaked bandages, discarded lancets, removed body organs, cultures, stocks, swabs used to inoculate cultures, and discarded needles. This introduces Blue Cross® Medical Waste Recycling, LLC, a licensed waste management company that focuses on the recycling of medical waste. Many recyclable product dealers, wholesalers, and even manufacturers seek out bulk recyclable materials, usually purchasing them by the ton. The of New York-based company Recycling Center, Inc. shows how recyclable items such as metal, paper, and plastic can be sorted out, processed and resold in bulk numbers to these dealers, wholesalers and distributors from an established recycling center. Plastic recycling operations gather, sort and resell used coffee cups, soft drink bottles, shrink wrap, bread bags, cling film, car bumpers, food packaging, milk bottles, cooking oil containers, many other types material. This identifies all the things that could go wrong in the initial launching of Scottish Recycling Company. It also provides a roadmap to overcoming those problems along with strategies to succeed. You probably can see the demand for recycled paper all around you. Many businesses make it a point of using such products as much as possible to satisfy their eco-conscious customers. This shows a comprehensive process for recycling paper. It explains ways to earn a profit from used paper and how recycling this material can fulfill growing demand. This type of business works with municipalities to provide an economical alternative for the disposal of human waste sludge. On the sales side, it offers consumers quality recycled products made from useable waste stream materials. This company's outlines how it's done. There is now a demand for recycled plastic products in consumer and industrial applications. The of Replay Plastics describes one way to profit from that trend. It describes a process for establishing a polyethylene terephthalate (PET) cleaning and refining plant to produce recycled plastic products.